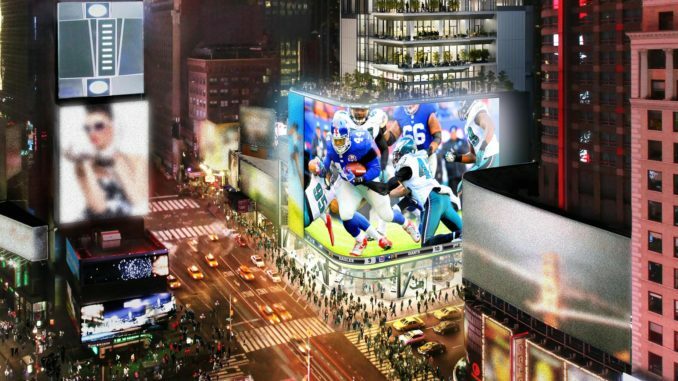 Last month, the NFL launched a new interactive promotion in Times Square, and it looks like this is one NFL fan experience that is not to be missed! 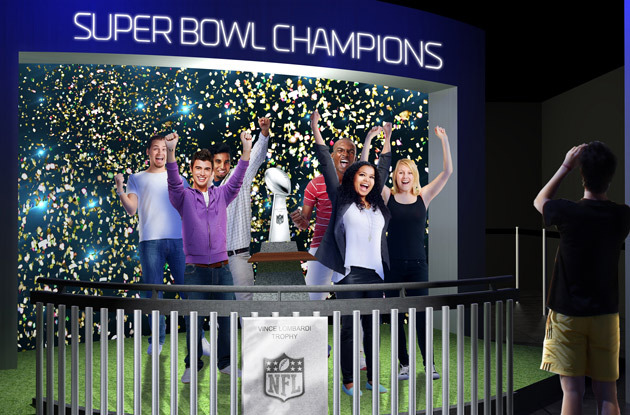 The interactive display was produced by the NFL in conjunction with Cirque du Soleil. And from what we’ve seen, it has all the action you would expect from the NFL, along with the amazing interactive audiovisuals you would expect from the creative geniuses at Cirque du Soleil. Over the past few years, we’ve reported on some awesome interactive activations that various brands have produced to give fans impressive high-tech glimpses of the NFL fan experience. From virtual reality to interactive passing games and hands-on player drills, we’ve seen it all. And many of these different interactive fan experiences have been rolled up into one amazing activation in the NFL’s new signature experience in Times Square. When you step into the NFL Experience in Times Square, you’re welcomed into a large hall full of NFL memorabilia. The center of the hall is filled with 32 interactive touchscreens, each providing information about one of the league’s franchises. After soaking up some knowledge about their favorite team – fans move along to explore four floors of interactive exhibits where state-of-the-art technology immerses them in an unforgettable fan experience. One exhibit allows fans to virtually step into the uniform of their favorite players. Fans stand in front of a camera that uses augmented reality technology to suit the fan up in the pads, jersey, and helmet of the player of their choice. After they’re suited up, the camera follows their movements and they can jump, squat, and strike various poses as their face is projected in real time inside the virtual NFL uniform. In another exhibit, fans are given real footballs which they can throw to their favorite receivers. The receiver is shown running a passing route on an oversized interactive digital screen, and fans attempt to complete a pass to the virtual target in motion. The most talked about attraction so far has been the 185-seat 4D theater, which is designed to place fans inside a full NFL season and evoke all of the feelings and experiences that come along with competing on the gridiron week after week in front of packed stadiums across the country. Much of the action is filmed from the point of view of a player on the field, with first person views of the plays, the huddles, and the motivational locker room speeches. Fans get to experience the thrill of a victory and the agony of defeat – and this experience is getting rave reviews from fans of all ages. Effective activations are all about creating memories. When an experience triggers emotion, adrenaline, and genuine excitement – fans will remember that moment and they will forge an association with the league or brand that gave them that memory. One way to accomplish this type of real-world emotion is through hands-on events like foot races and blocking drills. But there is an additional benefit gained when technology is introduced into the equation. Technology produces data – and marketing departments around the world of sports are sprinting to build their data sets to create more effective and personal promotions for fans inside the stadium and watching at home. Big data is king in 2018, and marketing departments everywhere are looking for new ways to grow their data sets. Each additional field of data opens new possibilities to grow an audience through social networks and targeted promotions. High-tech activations are unique in that they both create the real-world emotion required for an effective fan experience – while harvesting valuable data about the fans, their networks, and their preferences at the same time. TGSM’s high-tech fan experience assets bring the best of both worlds to tailgating lots around the NFL every Sunday. Our interactive games, stereo broadcast system, and socially-integrated selfie booths create real-world emotion that fans love – before the game even begins. Our assets harvest an impressive volume of fresh data each and every time they are deployed. This high-tech tailgating experience is designed to provide data about key market segments that are sometimes hard to corner for the NFL and its sponsors. We attract millennials by providing a free high-speed data network on the tailgating lot. We attract women and families by providing clean, comfortable and luxurious restrooms with flushing china toilets and hot water faucets for washing hands. Our fan experience assets have proven themselves time after time at stadiums around the league. Our units have an instantaneous effect on the duration of stay for women and millennials at tailgating events. And within a few short weeks, they provide dramatic results in the attendance figures for these key segments. If you would like to learn more about TGSM’s high-tech tailgating fan experience, get in touch with us today at (888) 995-2285. One of our trained representatives will give you a virtual tour of the experience and answer any questions you may have about branding, integration, and more.